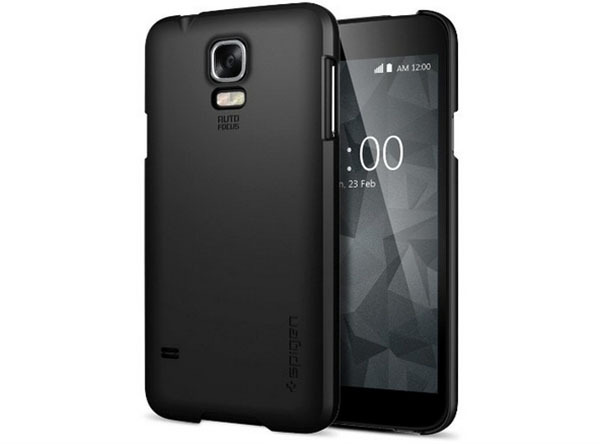 With the official announcement of Samsung Galaxy S5 two days away, a variety of cases from Spigen have already started popping up on the internet. 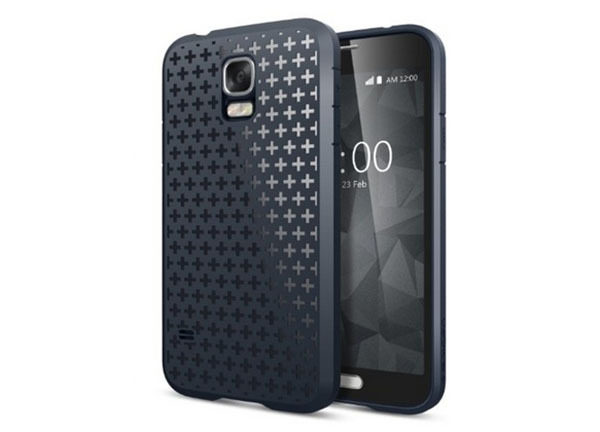 Amazon being one of the online retailer listed a host of Spigen cases for the yet unannounced Galaxy S5 smartphone by Samsung. 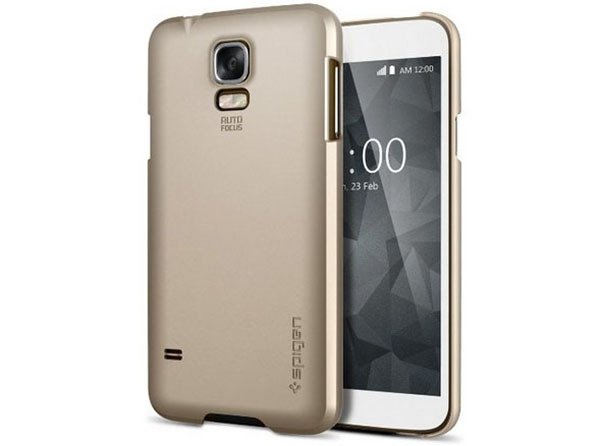 We will definitely know what the flagship from Samsung holds for us in terms of software, hardware and design not long from now, but for now, it would seem that Samsung Galaxy S5 may feature two variants judging by the cases that are mounted on the following S5 mockups. 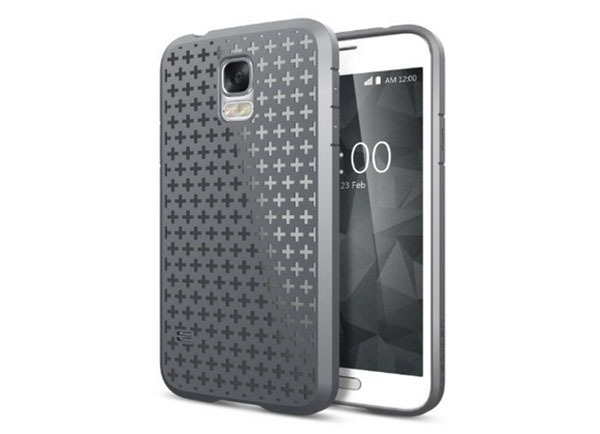 If one pays close attention to the cases, it is apparent these pictures do in fact show the new flagship Galaxy S5. It would seem that the smartphone will feature dual LED flashes just below the rear facing camera. Further analysis of the pictures indicate that the one variant of the smartphone will not have a hardware button. If you look closely, you will notice that one of these variant does not have the traditional home button that Samsung Galaxy devices usually feature at the bottom. While this particular handset could be the purported Galaxy S5 Prime, there is another variant with the traditional setting of a home bottom at the bottom corner. In summary, looking at the pictures, we can take a few guesses. 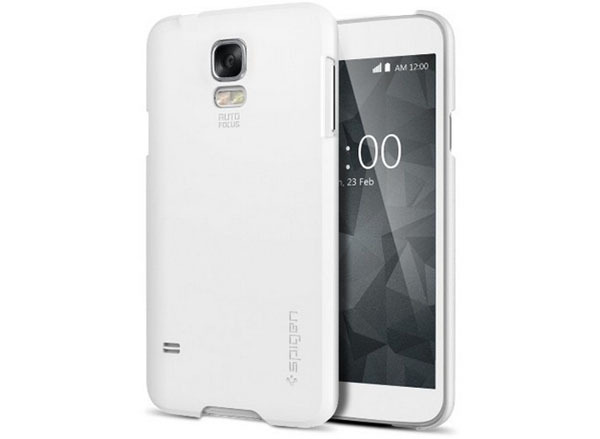 The S5 will be released with two variations, the position of the speaker and the dual LED flash below the rear camera. One final thing that is given away looking at these pictures are the color variations. If what you see in the pictures below is indeed the Galaxy S5, it is safe to assume that two colors will be released; white and black. We on the other hand will take a shot, considering a certain pattern Samsung tends to follow, and say that three different colors may be released to begin with; a shade of blue or black, white and gold. What we do know for certain is that the latest flagship from Samsung will indeed be able to take a dip in the pool. There is no way to tell for certain if these pictures actually paint a real enough picture of the Samsung Galaxy S5 to be announced on Monday the coming week, they sure give us a tiny preview of what may be coming to us on D-Day. Feel free to check out the images below and let us know what you think.